My, how time flies . . .
Like any family with young ones, we’ve been enjoying the landmark moments in the development of our children. 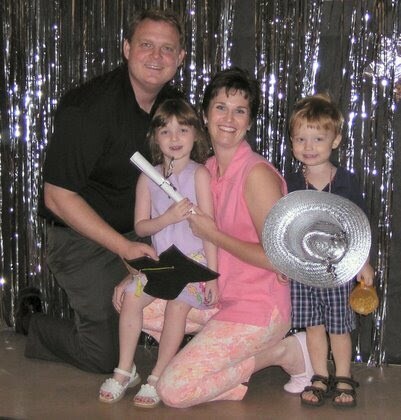 Kaitlyn (5 years) graduated from Preschool this year and is ready to begin Kindergarten in the fall. She is a budding artist who loves to color, dance, swim and play with dolls. In new environments she will transform herself from a shy child hiding behind mommy to talking your ear off in a matter of 30 seconds! Kaleb (2 ½ years) has been steadily adding to his vocabulary and enjoys copying whatever his big-sis is doing. He loves balls, trucks, dancing/grooving and donuts! We can’t drive past our small town donut shop without his crying out for a chocolate with sprinkles :-) ! Karen continues to work out the balance in life between family, ministry, friends and personal time. Although she hasn’t found the perfect balance yet, she’s trying! Her role as coordinator of Van MOPS (Mothers of Preschoolers) is very fulfilling but also very time consuming. 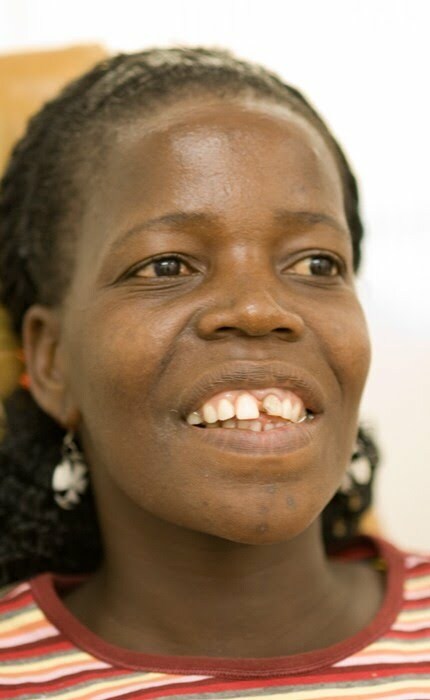 With 40 moms and 50 children enrolled, the opportunities to provide encouragement have proven to be endless. With a talented group of 8 moms on the Steering Team, Kreig is always amazed at how many hours Karen can spend planning on the phone! In addition to this she finds herself cooking many meals for families with sickness or new babies and hosting play dates. Our group was significantly impacted by the death from SIDS of our Pastor’s 10 week old baby, Cade. Although he was only with us briefly, he had captured all of our hearts. Karen especially had bonded with him because she had spent the first 24 hours assisting Stacy (his mother), in the hospital, during her recovery from an emergency C-Section. During the last meeting of the year it was very encouraging to hear 20 moms stand up and share how much MOPS had meant to them and how encouraged they’d felt to know there were others standing alongside of them in this wonderful but challenging phase of life! Next year Karen will begin passing on the leadership responsibilities and is excited that two talented moms are willing to take on the added responsibility. In March, Karen traveled to Chicago to promote Mercy Ships at the Annual Orthopedic Surgery Convention. She enjoyed recruiting doctors and procuring much needed supplies and equipment for the Africa Mercy. Since we have lived in East Texas, Kreig has enjoyed being a part of the Men’s group at Church. One of the themes from this past year has been discovering your unique design – identifying your strongest skills and motivations. As Kreig reflected upon the ideas presented in the study, it confirmed to him that his current job, as the Chief Information Officer is not the best fit. Kreig has always enjoyed the creative aspects of engineering, whether it be designing mechanical systems, or programming computers. While his work as CIO has involved some development of new systems, this is a small part of what he oversees and much more of the work involves managing day to day operations. Having served in this capacity for over five years, Kreig now longs to return to a role that involves creatively solving engineering problems. After much prayer and consultation with close friends, Kreig has informed his manager of his intentions to resign. Together they are working on a transition plan to bring in the next CIO. While the timing of this transition is not yet finalized, the most likely scenario would be for Kreig to step out of the position sometime in October. At that point, we are planning, as a family, to go to the Africa Mercy for about four months. Kreig would fill a vacant IT Manager position and oversee the deployment of this new ship during its first field service in Ghana. We would really enjoy the opportunity to return to Africa and serve on a ship. We are excited about the possibility for Kaitlyn and Kaleb to have this experience and for Karen to work part time as a nurse. Following this shipboard service, we would return to East Texas to tidy up any last CIO items and begin our transition to the next chapter of our lives. We do not yet know what this will involve. Kreig intends to look for job opportunities in Texas (Tyler or Dallas) and California to see what options are available. Throughout our lives, God has been faithful to lead us to opportunities we never would have imagined. We know that we can trust in His leading and timing for this chapter of life as well and are eager to see where He will take us. Scott Harrison is a talented photojournalist who has been working onboard the Anastasis for the last few years. From time to time, he emails stories and pictures from his experiences of working with Mercy Ships. The following is a story that reminds us of many experiences we had while living on board the Anastasis. 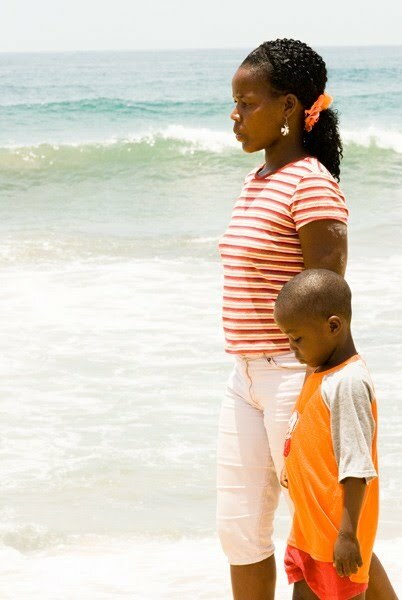 It’s the story of a woman name Marthaline who lives in Liberia, West Africa. I left the ship early this morning to look up Marthaline with a friend. Some of you may remember her story. A monstrous benign tumor grew out of her mouth for years, and she was abandoned by her husband - left to care for three kids. Doctors Without Borders brought her to the ship last year where the offensive mass was removed by Mercy Ship surgeons in a simple hour and a half procedure. We found her on the outskirts of Monrovia. She lives with 12 people in a house about half the size of my last Manhattan apartment. And with her six-year-old son, Newton. Our plan quickly developed, we'd get her a larger room of her own where she can finish going to school. Pay rent for 2 years in advance at a whopping $10 a month so she could go to school and not have to worry about the roof over her head. And her son, who for the life of me I couldn't coax a smile out of, simply had go to school. Far too easily, all is arranged. His uniform, books, pencils and year's tuition will set us back about $50. Then in the Land Rover to the dental clinic. The tumor took out almost all of her bottom teeth. The volunteer dentist from America took wax molds and chose 8 false teeth. He asked Marthaline how she liked the spacing, and then made adjustments. She practiced smiling in a mirror. She is truly beautiful now, unrecognizable through the lens. I so clearly remember taking her "before" picture - but it wasn't the tumor that so disturbed me. It was her eyes. Now, Marthaline's a masterpiece in process, in forward motion. A few small steps closer to wholeness with a little money and a little love. We stood under a palm tree by the ocean and she told me how people treated her. "Not a human being," she said. Her head shook as she remembered almost committing suicide. Today, I'm quite sure she was glad she didn't. Although our communication has been sparse this year we want you to know how much we have appreciated your partnership with us - making our work possible. Thank You! We would greatly appreciate your continued prayer and support as we navigate through this time of transition. We are waiting with great anticipation for the day when we can write a patient story from first hand experience once again – yet this time with our children by our side! We will be in California for two weeks in July before flying to Minnesota to celebrate Kreig’s grandpa Kermit’s One Hundredth Birthday! We hope to have an opportunity to see many of you during this time.